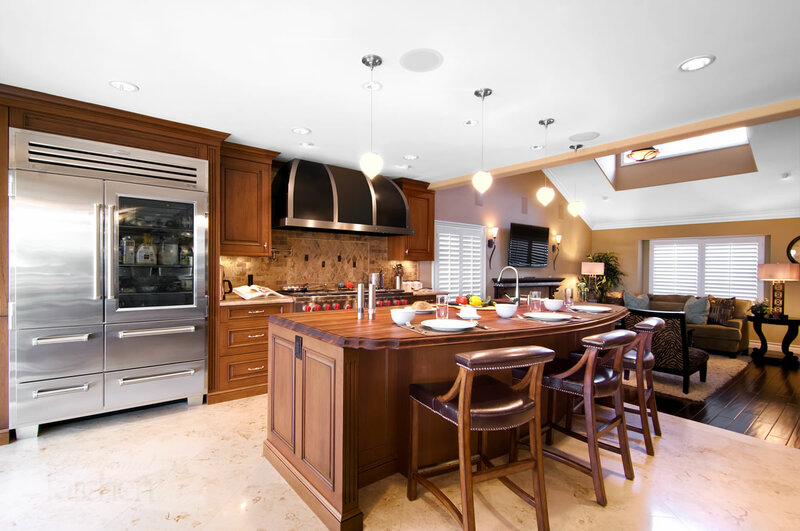 Open Spaces in Yorba Linda | Le Gourmet Kitchen Ltd. This transitional kitchen design in Yorba Linda utilizes the large available space to create a great room that is sure to be the center of family and social life in this home. The open plan set up incorporates the kitchen, a breakfast/eating area, and the living room. The natural connection of these rooms enhances the way this space is used for everyday living and entertaining. To make this area bigger and allow the owners to enlarge the kitchen, we moved the dining room outside to a heated and covered patio. 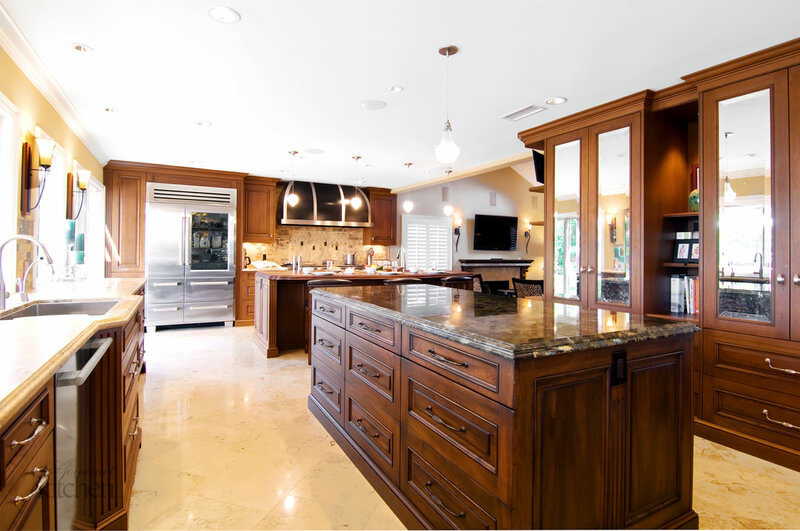 This allowed us to create the perfect kitchen for this home, which is divided into two amply sized, distinct work areas. The kitchen design work zones were constructed to allow more than one person to work in the kitchen at one time in a well-organized space, with one area focusing on cooking and the other on cleaning. Every detail was meticulously planned in this kitchen remodel. The design features Wood-Mode’s Brookhaven semi-custom cabinets, along with Hafele chef’s pantry interiors, accented by Top Knobs hardware. The custom metal Vent-a-Hood is a focal point in the kitchen design, immediately drawing the eye toward the cooking area with a Sub-Zero refrigerator and a Wolf oven and range. The large island in the cooking area includes a a Grothouse Wood Countertop. The cleaning zone incorporates two Miele dishwashers adjacent to a second large island that offers more work space. Franke sinks and KWC faucets fit neatly into both the cooking and cleaning zones. The design also includes an ice maker, custom banquet, and custom table. The warm wood cabinetry sets the tone for this inviting kitchen design color scheme and brings a traditional charm to the space. The use of antique mirrors, along with a custom bar and room divider add to the unique appeal of the room. Friends and family will enjoy cooking, eating, socializing, and creating memories in this open plan, multi-use space for years to come.